MG is probably one of the most famous names in British Motoring history. MG actually stood for Morris Garages, who were the Oxford distributors for Morris Cars Ltd., both of which were owned by William Morris. In 1922 at the age of 33, Cecil Kimber, the man who later founded MG, was appointed as the sales manager at Morris Garages, and by the following year he had become general manager. With his interest in driving sports cars and car design, he set about building new and more sporting bodywork for the Morris Oxford and Cowley Chassis. By 1924 Morris Garages were advertising the "MG Special four-seater Sports" and the now famous octagonal MG badge was seen for the first time. More models were introduced in the following year, and it was in one of these that Cecil Kimber won a gold medal in the 1925 Lands End Trial motor race. By 1929 Morris Garages had become the MG Car Company and had moved to Abingdon, from where during the early 1930's, MG achieved great success in motor sport, which of course aided sales of their road cars. William Morris (Lord Nuffield) sold the MG Car Company in 1935 along with other of his privately owned companies to Morris Motors Ltd to form the Nuffield Organisation. After this MG did not have anywhere as much involvement in racing, leading many to say that 1930 -35 was the period when MG firmly established it reputation as producers of fine sports cars. After the Second World War car production was to resume, and then in 1952 MG became part of the British Motor Corporation (BMC) when the Nuffield group merged with Austin. The MGA sports car was launched in 1955 to meet competition form family rival Austin-Healey, and this car sold well on both sides of the Atlantic. The usual badge engineering employed by BMC applied, as with other marques in their stable, equally to MG, and saloons such as the Farina designed Austin Cambridge were made in an MG variant, and were of a more upmarket and sporting nature. 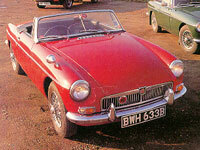 1962 saw the arrival of what was to become one of the most popular sports cars of all time - the MGB. In 1968 BMC, after merging with Jaguar and the Leyland Motor Company, became the British Leyland Motor Corporation. This in turn was taken over by the Rover Group, which was later bought by the German Company BMW. Production of MG cars at Abingdon was stopped in 1980 and the MG name was then for the time being only used on the higher performance versions of the Austin Metro, Maestro and Montego. In 1992 the new MG RV8 was launched featuring the Rover V8 engine, and coincided with the 30th anniversary of the launch of the MGB on which its styling was based. This was later followed by the all new mid engined MGF in 1995. MG is now part of the Independent and British owned MG Rover Group. Introduced in September 1955, the MGA was the first sports car that MG produced in full width, contemporary style bodywork, however it was still built on a separate chassis. The MGB was first introduced in 1962 at the Earls Court Motor Show and it was to become Britain's best selling medium sized sports car of all time. The MGB GT V8 was introduced in 1973, and was based on a conversion first carried out by the car tuner Ken Costello some two years earlier. Introduced in 1967, the MGC roadster and MGC GT fixed head coupe were outwardly very similar to the smaller engined MGB & MGB GT.